One approach to making homes and other buildings more resistant to ignition is to focus on building materials and construction standards. Such standards engage individual property owners and enhance the effectiveness of community-wide actions. Building standards and adjustments in infrastructure are more easily applied to new construction and development than to existing development, and communities can be designed or managed in ways that enhance response effectiveness or mitigate risk. 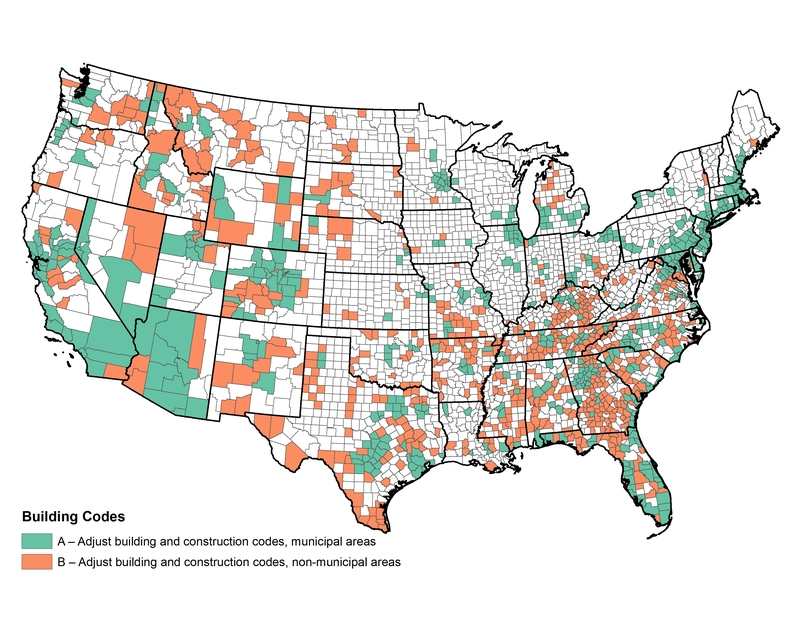 Changes in building codes are more likely to be effective when targeted at areas of new construction in high-hazards areas, and consequently counties with increasing WUI area or increasing WUI home density growth—the latter being more closely aligned with increasing home construction overall—suggest opportunities where such efforts are most likely to have a significant effect. Because municipal and non-municipal areas tend to exhibit varying levels of ability to implement building standards, these are mapped separately (Options 7.a and 7.b, figure 3.10). 7.a: Adjust building and construction codes, municipal areas. Data explanation: These are advantaged suburban or urban and suburban counties, or eastern areas that experience prescribed fire, or private forested urban or suburban areas [Cluster = 4 or Combination = 7A, 8A, 7H, or 7I]. 7.b: Adjust building and construction codes, non-municipal areas. Data explanation: These counties have high Wildland Urban Interface areas or experience housing growth, and are not agricultural nor experience low amounts of fire, and they are not suburban or urban areas [WUI growth >35 or Percent growth in housing density in WUI >15 and Cluster ≠1, 5 and not in Option 7A]. Conclusion: Protecting homes from ignition by wildfire is a practical step that is applicable anywhere homes can be found adjacent to natural vegetation. Similarly, coordinated action at the community level is universally advantageous, but essential when wildfires originate outside the community perimeter and threaten all residents collectively. New construction offers risk-mitigation opportunities that may not be available elsewhere.